Human beings like to have explanations for everything, and we find seemingly inexplicable events extremely troubling. We disdain the notion that some things just happen without any rhyme or reason for them. This dependency on meaningful events makes us prone to contriving and accepting supernatural explanations even though science offers us explanations that are more satisfactory (although often less comforting). I am, of course, talking about our tendency to claim that an event was a miracle. When an improbable event occurs, such as a “miraculous” recovery from cancer, people of many different faiths and religions are quick to claim that the recovery was a result of some form of supernatural intervention, rather than merely a product of statistical probability. That should not, however, be our default. Any time that science offers an explanation, we should default to it rather than proposing a divine plan that is being supernaturally orchestrated. To be clear, I am not trying to convince anyone that God doesn’t exist, or even that there is no such thing as the supernatural. The existence of supernatural beings is a question that science is completely and totally incapable of addressing. It’s the realm of philosophy and theology, not science. So it doesn’t bother me if people are religious and find comfort in believing in a supernatural deity. What bothers me is when people allow their spirituality to trump science and logic. That’s what I take issue with, and that’s what I am going to address in this post. Several years ago, there was a large storm that knocked over numerous trees and caused a great deal of damage. When I emerged from my house to go to work the following morning, I observed various branches and detritus strewn around my yard, and I noticed that one particularly large branch had fallen right beside my car. If it had blown over just one or two centimeters further, it would have caused several hundred dollars worth of damage. As I stood beside my vehicle staring at the branch, it suddenly became clear to me why people are so eager to opt for supernatural explanations. At a quick glance, it seemed extraordinarily unreasonable that the branch would have come that close to hitting my car just by chance. It was an improbable event that my puny primate brain struggled to reconcile, and for the briefest millisecond it was tempting to think that some malevolent entity must have been watching out for me and my property. Being a rational person who understands the law of large numbers, however, I dismissed that explanation just as quickly as I generated it. What I realized was that my good fortune was nothing more than pure dumb luck [note: I am using “luck” synonymously with “chance” and am not implying that some force was acting in my favor]. When I considered all of the thousands of branches that had fallen during the previous night and all of the thousands of vehicles that had been parked near trees, it became obvious that we would expect a small subset of the branches to just barely miss hitting a vehicle. In other words, we would expect, just by chance, that lots of branches would fall away from vehicles, lots would fall on vehicles, and a few would fall right beside vehicles. There was nothing special about me or my car, there was no cosmic plan being orchestrated, I was just lucky. I just happened to be in the tail end of the probability distribution. Indeed, when I got on Facebook later that day, some of my friends were posting pictures of the damages that they had sustained, just as we would expect from a probability distribution. Conversely, other friends of mine had been lucky enough to avoid any repercussions of the storm, but, much to my dismay, they were quick to attribute their good fortunes to divine intervention, and give thanks to a supernatural entity who had protected them during the maelstrom. This is where I draw the line, this is what I have a problem with. It’s one thing to believe that God exists and to be thankful to him for life in a very general, ultimate sense. It is another thing entirely to make him into a cosmic puppeteer who is so concerned with the minutia of your life, and so directly involved in manipulating the physical world that he actually redirected branches to keep your precious property safe. Why should we accept the scientific explanation? Falling branches is admittedly a trivial example, but this pattern is widespread. I know many people who claim that everything from the precise genetic makeup of their children to the grade that they got on a test was a deliberate act of God. Perhaps the most common and disturbing form of this world-view appears at hospitals. People are extremely quick to distort medical marvels into divine miracles. On numerous occasions, I have seen someone recover from a cancer that has a high mortality rate, and instantly friends and family proclaim that it was a miracle! They claim that their prayers worked and God intervened and healed him. If we stop and think about it rationally, however, that explanation is hollow and lacking in logic. Conclusion: It was clearly a divine miracle! Hopefully the problem here is obvious. What justification could we possibly have for claiming that the recovery was miraculous when the person was taking scientifically tested medicine? Even in the rare case where someone recovers without seeking medical help, we know that the body has many astounding ways of healing itself, none of which require divine intervention. The fundamental problems here is the burden of proof. By claiming that something was miracle, you have just placed the burden of proof on you to demonstrate that there was no possible scientific explanation. It’s not enough that an event was improbable, you must prove that it was physically impossible before you can claim that it was a miracle. It’s worth pointing out that to demonstrate that something was a miracle, you have to show that a scientific explanation cannot exist, rather than simply that one does not currently exist. History has clearly demonstrated that the lack of a current explanation does not mean that an explanation doesn’t exist. Indeed many physical phenomena, such as magnetism, were once attributed to the supernatural. So, you need to demonstrate that a scientific explanation absolutely cannot exist. Let me give an example, suppose that on a clear, windless day, a regular person, wearing nothing but regular clothing jumped off of the Empire State building, flew over a mile (unaided), and landed safely on the ground. That would be a miracle because that would be an event that science simply could not explain. It would completely defy everything that we know to be true about physics. There wouldn’t be any conceivable future discovery that could explain that event, but here’s the important catch: no one has ever documented an event like that under properly controlled conditions and with reliable witnesses. It simply hasn’t happened. That doesn’t necessarily mean that miracles are impossible (that would be an argument form ignorance fallacy), but it does mean that we have never witnessed anything which we can safely call a miracle. Another way to think about this is to consider Occam’s razor. This is the principle that, all else being equal, we should default to the explanation that makes the fewest assumptions, because that explanation is usually correct. Claiming that an event was miraculous requires numerous unfounded assumptions that cannot be proven. You have to assume that the supernatural exists, assume that this supernatural entity cares specifically about you, and assume that this entity actually acted on your behalf. None of these assumptions are necessary for the scientific explanation. In fact, no assumptions are necessary at all because we understand probabilities, causal relationships between medications and recoveries, etc. Therefore, the miraculous explanation is unparsimonious and should be rejected. At this point, I generally find that people ignore everything that I’ve said and insist that the low probability of a given event somehow proves that it was miraculous. For example, I often have people proclaim that their recovery from cancer had to be a miracle because the doctors said they only had a 5% chance of survival. This is, however, no different from the branch example. Fine, you survived your cancer, but for every one survivor, there are 19 other people with that same cancer who didn’t survive. It only seems miraculous to you because you were lucky enough to be one of the outliers who made it. If you had been one of the 95% of people who didn’t make it, you wouldn’t be saying it was a miracle…because you’d be dead, and rather that talking about miracles, your family would be probably be spouting some nonsense about an incomprehensible divine plan to test their faith. An easy way to think about this to think about winning the lottery. The odds that you will win are extraordinarily low, but if you win, you don’t get to claim that it was a miracle because so many people played that it was certain that someone would eventually win. Your victory was nothing more than the law of large numbers playing itself it out. 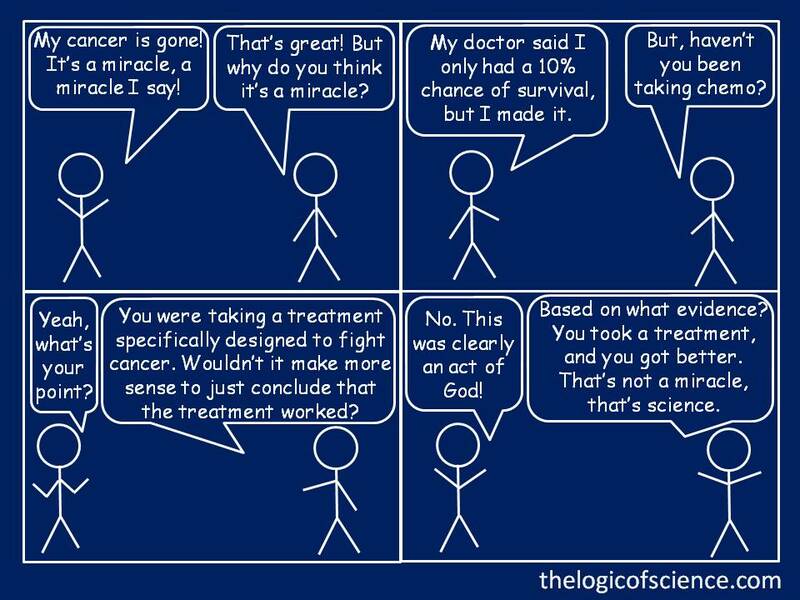 Similarly, recovering from an aggressive cancer is not a miracle, it’s just probability theory running its course. So many people get cancer that, just by chance, a few of them will survive even the extremely aggressive ones. Let me give another medical example to illustrate this. I often hear people describe rare births, such as quadruplets, as miracles because the odds of having them are extremely low, but when you consider all of the millions of people who give birth each year, we expect a few quadruplets to be mixed in there. So they only appear extraordinary and miraculous if you don’t consider all of the millions of perfectly normal births that occurred. Similarly, someone surviving an aggressive cancer only seems miraculous if you ignore all of the thousands of people who didn’t survive that type of cancer. A final problem is the sheer hubris of a the claim that events in your life are miraculous. It elevates you to a place of extraordinary cosmic significance. Consider the branches example again. Could I really be arrogant enough to proclaim that God cares enough about me to shield my car from harm, but he couldn’t be troubled to do the same for the hundreds of people who awoke to find tree limbs jutting out of their windshields? Similarly, if you survived a cancer with a 95% mortality rate, what makes you so special that God elected to heal you, but didn’t bother with the 95% of patients who died from that cancer? Inevitably people will respond with something to the effect of, “God’s ways are not our ways,” but that’s ad hoc nonsense. There is no rational reason to conclude that these events are miracles. Some people may be wondering why I went off on this tirade. After all, my blog is usually devoted to debunking anti-science arguments, not discussing philosophy. There are two key reasons that I think this topic is important. First, it has an extremely strong impact on how we view the natural world. It determines whether we are going to view the world as a logical, mathematical system or as a system in which probability is merely an illusion and everything is actually being carefully orchestrated by a divine puppet master. This is absolutely fundamental to whether or not we are going to accept science. If God is actually meddling with the world in the way that many people seem to think he is, then science is pointless. Suppose, for example, that we found a new cancer treatment that had a 30% success rate (as compared to the previous treatment’s 20% success rate for the type of cancer that it was designed for). If God was actually constantly performing miracles, that would mean that our “treatment” was actually worthless, because it was really all God. In other words, our treatment didn’t work, but it appeared that it worked because God was performing miracles more frequently than he was before, and in his divine wisdom he had decided to cure an additional 1 out of every 10 patients every time that we used this new treatment. Many people will object to this and say that the science does work, but sometimes God steps in and helps out. This is, however, extremely inconsistent, and it deprives you of the ability to ever claim that anything is miraculous. If we follow this through logically, then if your recovery from a cancer with a 95% mortality rate was a miracle, but the science does actually work, that means that everyone else in the 5% recover group was cured by science. What justification could you possibly have for thinking that God intervened on your behalf, but not on the behalf of the rest of the 5%? In other words, why do you think that they were cured by science, but you were cured by a miracle? You can’t have it both ways. You can’t accept the miracles and accept the science. This is why I care about this topic: a belief in frequent miracles completely undermines science. The second reason that I care about this is that it is a dangerous notion that leads to many anti-science views. For example, I frequently talk to parents who don’t vaccinate because they think that God will magically protect their children from illnesses. This goes beyond simple believing that a past event was miraculous, and it actually presumes that God will perform miracles for you in the future and will supernaturally destroy viruses and bacteria before they can harm your children. Religious global warming deniers often commit a similar blunder. I frequently hear them claim that God simply won’t allow us to destroy our planet, and the climate is somehow something which God will prevent us from modifying. As with the anti-vaccine argument, this view stems directly from the notion that God is constantly intervening in our lives. Similarly, we have all probably heard accounts of people who died from treatable illnesses because they decided to reject modern medicine and go to faith healers instead. This is the very real danger of accepting miraculous explanations instead of science. It completely distorts our view of reality to the point that science becomes trivial and meaningless, and that’s a frightening position for us to be in. I want to reiterate that I am not attacking people of faith. I’m not saying that you can’t believe that the supernatural exists, but I am saying that you shouldn’t let that belief distort your view of the physical world. The universe operates according to logical, mathematical rules, and seemingly miraculous events are easily explainable using probability theory and science. That doesn’t necessarily mean that miracles don’t ever happen, but we have no evidence to show that they happen. Therefore, we cannot default to a supernatural explanation. A miracle is by definition something that science cannot explain, so anytime that a scientific explanation exists, we should accept that explanation rather than claiming that a miracle occurred. This entry was posted in Uncategorized and tagged burden of proof, cancer, evaluating evidence, rules of logic, statistics. Bookmark the permalink. I wish you were more scientific – stop use of luck(y). You said it well – ” I just happened to be in the tail end of the probability distribution.” Don’t ruin it by adding the concept of luck. There is no such thing as luck as defined by Merriam-Webster: ” a force that brings good fortune or adversity”. If you equate luck with chance then maybe use of luck is OK, but generally luck is usually referenced as being caused by some outside agent or being caused by some routine – lucky shoes – being used/worn.